The Spanish government is offering a 300-million-euro loan to support Philippine government projects in infrastructure, agro-food, and tourism, the Department of Finance said. The Department of Justice (DoJ) stood pat on its ruling to prosecute Rappler for tax evasion when it rejected the motion for reconsideration filed by the online news site. The Department of Information and Communications Technology (DICT) is bolstering the country’s efforts to combat cyberthreats as it kicked-off yesterday a P508-million cybersecurity management system project. The government saved P10.7 billion last year due to procurement reforms that also helped speed up the implementation of some major infrastructure projects, Budget Secretary Benjamin Diokno said. The Philippines and the Democratic Socialist Republic of Sri Lanka forged five bilateral agreements during the state visit of Sri Lankan President Maithripala Sirisena, covering trade, defense, agriculture, and tourism, education, cultural and people-to-people exchanges. An Olongapo court has formally declared cash-strapped shipbuilder, Hanjin Heavy Industries and Construction Philippines Inc. (HHIC Phil. ), under corporate rehabilitation. The Philippines and other countries in Southeast Asia may become more attractive to British companies due to uncertainty over the outcome of the United Kingdom’s divorce from the European Union, the head of a British business group said Wednesday. The Philippine National Police Regional Office (PRO) in Ilocos Region has listed 38 towns and cities in the region under election watch list areas (EWAs). Three loan agreements with Japan are set to be formalized this 1st quarter of 2019, said the Department of Finance (DOF). YIELDS on term deposits fell across the board yesterday, mirroring a downtrend in bond yields as liquidity improved in the market. State pension fund Government Service Insurance System (GSIS) has released a total of PhP12.95 billion in GSIS Financial Assistance Loan (GFAL) since the program started in May 2018, benefiting 36,692 personnel of the Department of Education (DepEd). The Department of Labor and Employment (DOLE) 5 (Bicol) has allocated PHP10 million for the emergency employment of workers displaced by Tropical Depression Usman, which caused massive landslides in several parts of the region last December 29-30. Mitsubishi Corp. sold P11.7 billion ($225 million) worth of shares in conglomerate Ayala Corp. as part of the Japanese group’s portfolio management and rebalancing of assets. The Autonomous Region in Muslim Mindanao (ARMM) on Wednesday inaugurated some PHP20 million worth of projects in this city. NINETY-TWO small-scale business owners were recently given financial assistance amounting to P1.5 million by the local government of Muntinlupa. THE GOVERNMENT launched its first real-time public financial management system on Wednesday, which is designed to streamline the monitoring of agencies’ transactions. State-run Power Sector Assets and Liabilities Management Corporation (PSALM) will schedule another bidding on the consultancy services that will draw up the valuation and reserve price for the 650-megawatt Malaya power facility’s targeted privatization this year. The Court of Tax Appeals (CTA) has acquitted retired Lt Gen Jacinto C. Ligot and wife Erlinda Ligot of 4 counts of tax deficiencies worth P428 million. The Department of Health (DOH) on Wednesday renewed its warning against the use of electronic cigarettes, commonly known as “vape,” saying it is not a good alternative to tobacco. The Department of Health (DOH) on Wednesday said the government aims to reduce number of Filipino smokers from 21 percent to less than 15 percent by 2022. Militant lawmakers on Wednesday warned of an “oil price explosion” brought by the second tranche of the Tax Reform for Acceleration and Inclusion Act, or TRAIN 2. THE lack of decent jobs, low wages and high commodity prices, as well as the shift to federalism, will likely take center stage in the discussions in the run-up to the May 2019 polls, according to local experts. As many as 174 companies have formally expressed interest to import rice under the government’s out-quota rice importation program. 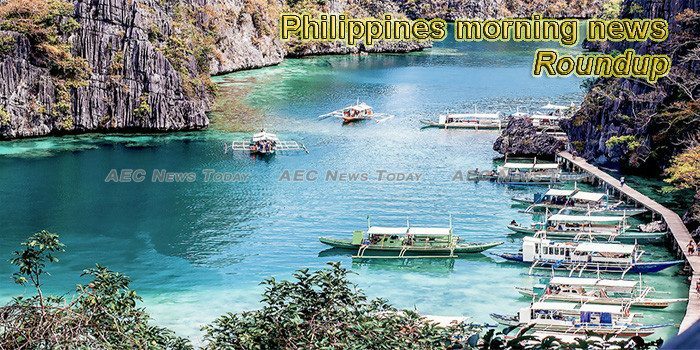 The Philippine Atmospheric, Geophysical and Astronomical Services Administration (PAG-ASA) has stated that Visayas -one of the three principal geographical divisions of the nation- will experience a dry season in the first quarter of the year. The government is planning to deregulate or relax regulations on sugar imports this year, Budget Secretary Benjamin Diokno announced on Wednesday. Budget Secretary Benjamin Diokno on Wednesday said removing the P75 billion allegedly inserted in the 2019 national budget could affect job generation and the government’s Build, Build, Build program. The House of Representatives passed on second reading the bill abolishing the Road Board for the second time, after it called its passage in September. A former government official in China wanted by Beijing for allegedly embezzling public funds amounting to P11 billion has been arrested by agents of the Bureau of Immigration (BI) in Pasay City. The Philippines-based armed group, Abu Sayyaf, recently released an Indonesian hostage who was featured in a viral video pleading for his life, but Jakarta denies that ransom was paid to the kidnappers to secure his release.